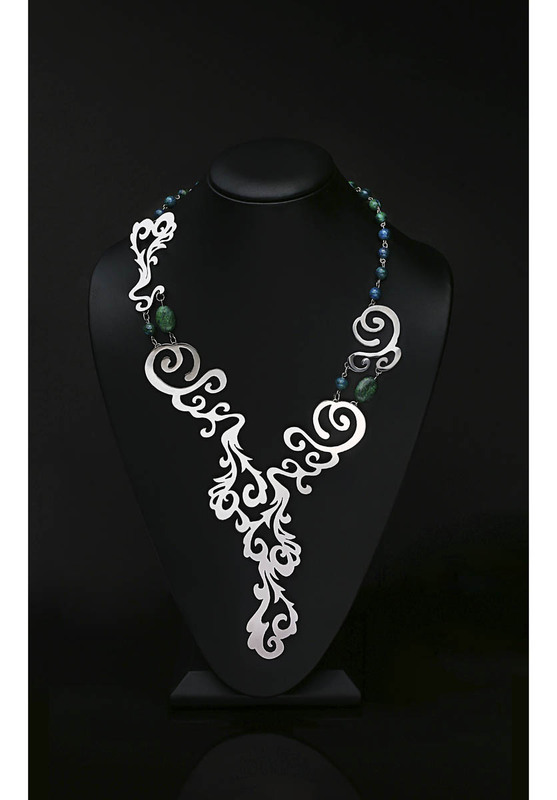 Peyton Rogers created a necklace called “Waterfall” based on seeing and experiencing waterfalls during her travels to various parts of the United States and Europe. A sophomore in high school, Peyton is 15 years old, but her understanding of her art and her focus are those of a much more mature designer. I used nickel silver and synthetic beads I found in an assortment donated to the art program. I was inspired by waterfalls and how they flow and move. I like to travel and have seen some on my travels, especially to Ireland and Switzerland. I learned self-reflection when creating this necklace. I saw what I could do, and it has inspired me to continue making jewelry. I feel making this piece has influenced me to challenge myself to go further. It has given me a confidence boost to enter more competitions. What do you like most about Waterfall? I like how it flows nicely down a woman’s chest. I have tried it on personally, and my parents have as well, to see how it fits and looks on other people. I am currently a sophomore in high school at Arlington Heights High School in Fort Worth, Texas. I have been studying jewelry for two years, since my freshman year in high school when I was 14. I discovered my love for making jewelry from my high school teacher, Ms. Cheryl K. Evans. She showed me that I didn’t have to confine myself to just creating on paper but could make the pieces in metal. Camping, hiking, cross-country and traveling are all my passions and strongly influence my designs. My mother and I have traveled a lot. Ms. Evans is both my jewelry/art teacher and mentor. She taught me everything I know and has given me the confidence to continue making jewelry. What other types of metal projects have you made? I created jewelry boxes and spurs in my first year in high school and belt buckles this year. After playing sports, or lying in bed I will start doodling. What is your favorite jewelry material? My favorite is silver, but since I am in high school, we only get to use nickel silver because real silver costs too much. What differentiates your work from others? A lot of people in my class like to create more artsy work, but I prefer to make pieces people can wear. I hope to go into my own business someday. I love the freedom it gives me; it lets me be creative. I love that I get to make a piece I would want to wear. I cast a flower and leaf in copper and a band in silver to make a ring. I still have it and wear it. However, it is not really practical since it is a large piece. I hang it on the antlers of a deer skull that hangs on my wall. It is my way to keep my jewelry up and out of my little brother’s hands. What is the one thing you most love about the space you work in? It is at my school. The studio space is large and there is plenty of room for everyone to work on their own and not be on top of each other. I like the buffer and polishing machine. Ms. Evans told me that if you ask the question “Is it good enough?” you already know the answer and need to try harder. I would pass on the above advice as well as not to let people tell you what you can and cannot make. You need to find out for yourself what you can do. The Victorian era has been especially inspiring, the architecture and the lace patterns of that era. I was really proud of winning the Stock Show in my freshman year. It made it possible to have people talk to me about my work, and it gave me great confidence. I would like to meet a jeweler who would help me become an independent jeweler myself. I had just finished a clay workshop and found the message that I had won. I couldn’t believe it, and then my teacher confirmed that I had won. Have you entered Saul Bell Design Award before? This is my first major competition. I took first place in the Fort Worth Stock Show and two medals at regionals and then went on to the State Visual Art Competition. I am going to State V.A.S.E. again this year. The Stock Show is a Fort Worth and Texas event to show your art and how it is influenced by this area.